Features the story of detestable breed of Witches. They disguise themselves as lovely ladies, when secretly they want to squish and squelch all the wretched children they despise. Luckily one boy and his grandmother know how to recognize these vile creatures, but can they get rid... read full description below. A true genius...Roald Dahl is my hero . (David Walliams). Phizz-whizzing new branding for the world's No.1 storyteller, Roald Dahl! Exciting, bold and instantly recognisable with Quentin Blake's inimitable artwork. 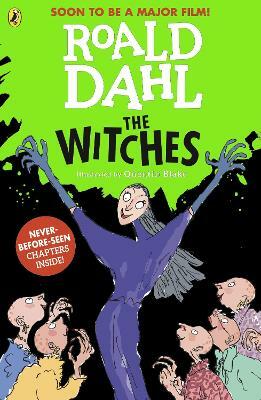 The Witches by Roald Dahl is the story of a detestable breed of Witches. They disguise themselves as lovely ladies, when secretly they want to squish and squelch all the wretched children they despise. Luckily one boy and his grandmother know how to recognize these vile creatures, but can they get rid of them for good? Now you can listen to The Witches and other Roald Dahl audio books read by some very famous voices, including Kate Winslet, David Williams and Steven Fry - plus there are added squelchy sound effects from Pine wood Studios! And look out for new Roald Dahl apps in the App store and Google Play- including the disgusting Twit or Miss! and House of Twits inspired by the revolting Twits.